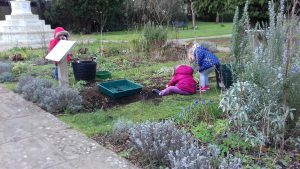 Last week we had the pleasure of gardening with a few of the children from Mentmore Road Under-5s, who meet in the pavilion on Mentmore Road playing fields. They’ve joined us ever since we started gardening at the Memorial Gardens, usually sowing things like nasturtiums, peas and carrots, and coming down to see how they’re growing. Eating peas straight off the plant was one of the favourite activities last year! This year, they were keen to help us back in early February, while it was still cold, too cold to sow anything. So we needed to find things for them to enjoy doing – and the obvious one was to help us get the ground ready for their peas and carrots. Instead of some of the usual Friends of the Earth volunteers clearing away self-sown plants that were in the way, we let the children do it – you can have two preschoolers pushing the fork into the ground next to one of the purple toadflax plants there, then (with a little help from one of the gardeners holding the handle), they can lever the whole plant and root ball up out of the ground. I thought they’d enjoy doing it; I never guessed how entranced they’d be to see it come of the ground, and to look at all the roots they don’t usually see. Some of the other children dug a hole in the next bed, then we all carefully lifted the uprooted plant across, placed it in the hole, and ‘put it to bed’ by filling the gaps with soil and pressing them down with a trowel (gently!). Then we moved another couple of purple toadflaxes to make a group, which gave everyone a turn at whatever they wanted to do. And then, of course, the bit the children really, really love – the plants needed watering in! From long experience now, we use four child-sized watering cans, half-filled – that’s an amount they can manage without spilling the water over their feet, and taking turns isn’t so bad as your turn comes round again pretty quickly. When I go over to the tap to refill our ten-litre container, Some of the children like following me over to have a look around – I love seeing the gardens through their eyes, they take pleasure in the most mundane tasks. They’re a real inspiration. A couple of years ago we discussed why we don’t use peat. At this time of year, when gardeners are going out to buy compost to start sowing seeds and repotting plants, could we make a direct appeal to buy peat-free compost? We do try not to bang on about the environmental principles that underlie what we do at the Memorial Gardens, but I’d like to make an exception this time, because climate change is accelerating much faster than we thought it would a couple of years ago, and we have to reduce carbon emissions urgently in the light of the latest evidence on climate change. When I wrote that first post, the situation was bad, but there was a lot of hope that if we could limit our greenhouse gas emissions, we could stop the earth’s temperature rising uncontrollably. In the last two years the situation has got much worse, much faster than we expected. When peat is dug up to make cheap multipurpose compost, very large amounts of carbon dioxide are released into the atmosphere, and we just can’t afford to keep doing it. Peat-free composts have improved tremendously over the last few years, and they’re being stocked much more widely; with bulk-buying, the price has got much closer to the price of ordinary (peat-based) multipurpose compost, which is cheaper to produce. We’ve rung round local suppliers to find prices for ordinary (= peat-based) and peat-free multipurpose composts, and apart from the most heavily discounted multibuys, the difference in price for three 50-litre bags or equivalent would only be the same as a couple of cups of coffee. Wickes has New Horizon peat-free at £4 for a 50-litre bag, which is cheaper than peat-based multipurpose compost at most of the local suppliers. If you prefer the Sylvagrow range, they’re stocked locally by Potash Nursery, and others are being introduced all the time. Edited on 8th March: we’ve rung round a number of local suppliers, and found that most of them are stocking good, reliable peat-free compost – Sylvagrow, Westland’s New Horizon, or equivalent. The price is generally a little more than peat-based multipurpose composts, but the gap is much closer than it used to be, and it really is only a little more expensive now. Locally, suppliers (in alphabetical order) include Dobbies, Frosts, Homebase, Leighton Buzzard Garden Centre, Potash Nursery and Wickes; and Ascott House tell us that later in the year they’ll probably have whichever peat-free compost they’re using this year for sale in the car park, along with plants they’ve potted up in it – I think they’re the only local supplier of plants grown in peat-free compost at the moment. If anyone cares to add to the list, add a comment or email me as usual! This entry was posted in Uncategorized on March 7, 2019 by foe. Much commented on and appreciated by the many people who visit the war memorial around this time. This entry was posted in Uncategorized and tagged Remembrance Day on November 9, 2018 by foe. 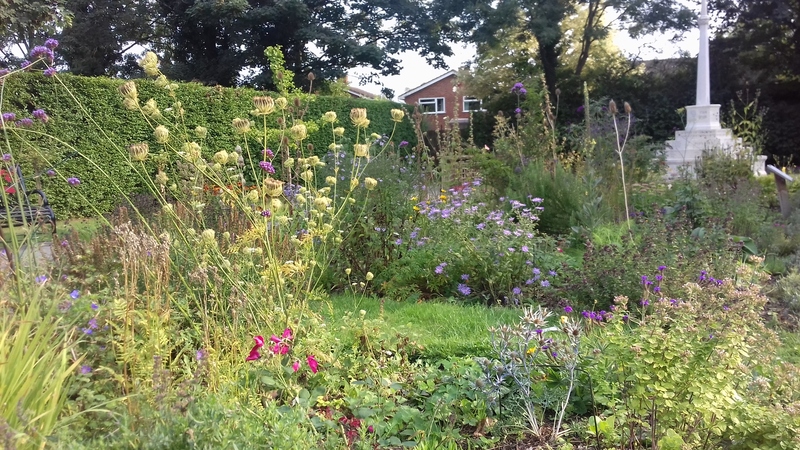 We didn’t take as many photos as usual this year, but here’s one of the gardens a couple of weeks ago – still lots of interest as we go into October, quite a bit of colour, a lot of height, and many interesting seed heads that are attracting goldfinches and other birds already. This entry was posted in Uncategorized and tagged seedheads on October 2, 2018 by foe. 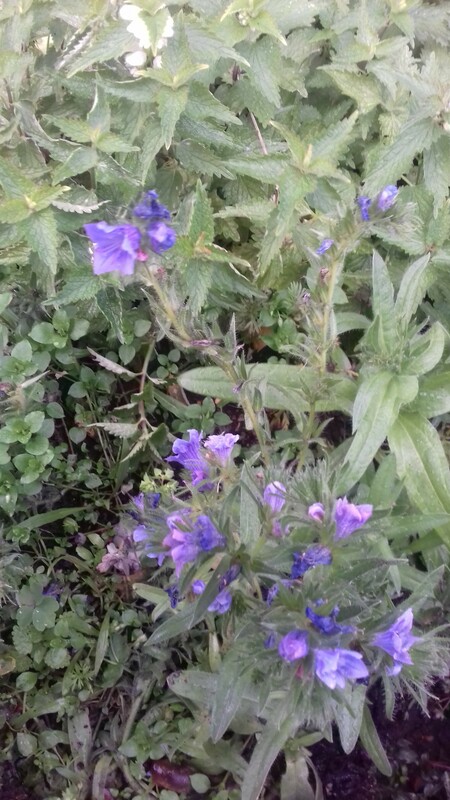 An earlier post mentioned that we were trying to introduce more perennial and late-flowering UK native flowers into the bed nearest the car park. This involves a completely different form of wild flower management from what we need to do to keep the poppies coming back every year, and we’ve been asked a couple of times what we’re doing in that half of the bed – in particular, we’ve been asked if we’re growing a meadow. Well, no; in a smallish, narrow bed, with half given over to cornfield annuals that like rich soil, we don’t think we’ve got room to grow a meadow that would prefer poorer soil (one of the best ways of establishing a new meadow is to remove the top layer of soil, and plant into the next layer down, which will have fewer nutrients in it). So we’ve left a number of the self-seeded cornfield annuals, particularly the oxeye daisies, and started moving plants from other beds into the spaces between them. For example, a few years ago the children from Mentmore Road Under-Fives sowed wild flower seeds in the second bed up from the memorial, and a couple of plants have succeeded so well that they’re crowding out many of the other plants we’d put in that bed; so we’ve tried transplanting the overgrown clumps of wild flowers into the top bed. The various types of scabious have been really successful, and so has the kidney vetch; however, we’re finding it harder to establish Jacob’s ladders and Welsh poppies there. We’ve recently added Geranium sanguineum to extend the flowering season for bees – this is the pale pink variant ‘lancastriense’ that grows wild on sand dunes on the north-west coast, rather than the more common, magenta-coloured one, whose flowers don’t seem to be nearly as attractive to bees (which is a pity, as it would look great in that bed). The ‘lancastriense’ variant was featured on Gardener’s World a couple of years ago, with Carol Klein extolling its virtues while huddled up against the side of the dune where it was growing, on a very blustery day. The landscape here in the gardens is rather less dramatic! but as the plant grows well in gardens in Mardle Road, which runs behind the Memorial Gardens, so we’re hoping it’ll be equally successful in that top bed too. In addition, we have a lot of black meddick and forget-me-nots forming an understorey that seems to be very attractive to insects – there’s a real ecosystem down there, for those with the flexibility to get down to look at it (and get back up again …). We had one musk mallow plant surviving in one of the middle beds, from several that were planted when the beds were first established; the survivor died after a year, too, but not before setting seed, which we sowed in a seed tray and left until this spring, when it germinated. We now have fifteen small plants, one or two of which will find their way into that end bed, to provide some structure and interest when the poppies die down, and some of the others will probably be added to some of South Beds Friends of the Earth’s other bee-friendly sites around Leighton, to keep the display going later into the year. But at the moment, with this heatwave burning up quite a few of our flowers, and no rain for weeks, we’re not thinking of putting any more new plants in; we’ll get back to working on that bed once it’s had a good soaking! This entry was posted in Uncategorized and tagged growing wild flowers on July 8, 2018 by foe. 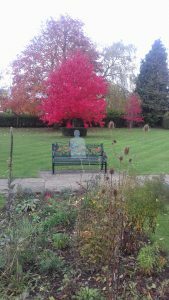 We’ve been asked a couple of times why there are so many dead leaves on the flower beds at the moment. They’re there for two reasons; the first is that we’re using them as a mulch, to try and keep moisture in the soil, while adding more organic matter without overfeeding the beds. We recycle all the material we take off the beds as compost, which we add to the beds in autumn to increase soil organic matter, which in turn helps the soil retain more moisture, as well as feeding it. We don’t have any compost available yet, but we clearly needed to do something to make the most of whatever water we’re putting on the beds as it’s been so much hotter and drier than usual, and the heatwave started so early – we’d only just got used to the fact that the freezing wet winter and spring had finally given way to summer! So even though we wouldn’t expect to be able to use leaves for a year or two after we’ve started a leaf mould bin, we did start rifling through our new bin in the work area behind the Memorial Gardens to see if enough leaves had rotted sufficiently to be put out on the beds to help keep in any moisture there is in the ground. We’d put quite a few new plants in, grown from seed or from cuttings, and we weren’t able to water them every day to establish them; this way we can water them just once or twice a week while they establish. We hope it doesn’t look too untidy! The mulch is making a real difference, everything looks much fresher than we’d expect in this heat and drought, and most plants are still growing on well. We’d still like a few good heavy showers, though! And the second reason? It’s a great substitute for bare earth when you’re three years old and want to just dig something with a trowel. Last week when the children from the local preschool came over to help us water, we dug up some of the potatoes they’d planted before Easter and found that their second favourite activity (after watering) was digging with a trowel. Problem – there isn’t enough clear soil to let them dig. Solution – we filled a large flexible trug with leaf mould, put it next to the flower beds, and let them dig it out and put it on the earth around the plants, and let them get on with it. Result – happy children and some very well-mulched flower beds! This entry was posted in Uncategorized and tagged leaf mould, local preschool, watering on July 7, 2018 by foe.